Why: Anybody that knows me instantly thinks of haircolor; I change mine so frequently, I might be lining the pockets of most of Manhattan’s colorists. But every pro will tell you that dye does a number on strands, and repeated coloring can completely kill hair’s natural shine. 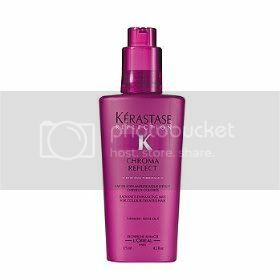 Thankfully Kérastase Chroma Reflect Radiance-Enhancing Milk smoothes all the kinks and crevices in my hair shaft, allowing for light to reflect and better show off my new—and definitely not last—haircolor. Best part: It’s extremely lightweight, yet delivers a ton of conditioning power that leaves hair feeling extra-soft.